For almost her entire life, Maggie Bennet has had to endure the stares and the judgment of her peers in her 1904 Newport home because of her mother's peculiar and sometimes erratic behavior. But when she disappears, Maggie can't and won't believe that she is truly dead. So she is reluctantly dragged from Newport across the country to the newly opened Yellowstone National Park by her father, who holds secrets to her mother's whereabouts and past. When she arrives, Yellowstone isn't at all what Maggie expects: it holds great promise and beauty, but also houses old secrets and pain, and Maggie is forced to stand on her own and decide her place in it all. 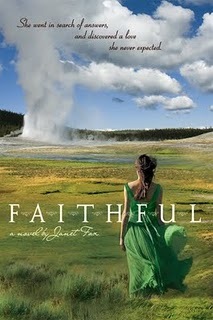 Faithful is a beautiful, descriptive, and vivid historical novel, and Fox does an excellent job at bringing to life one of the most popular parks in the United States in its very early years, when the tourists were beginning to come in great numbers, and the grand hotels and buildings were being built. But more importantly, Fox captures Maggie and her frustrations of her position as a young woman in the early twentieth century, and her longing to be happy and free to choose her own way. Everything that Maggie has ever known is thousands of miles away, and she tends to fret over her lost life, lack of material possessions, and how powerless she is to change anything. But as she explores Yellowstone, Maggie learns there is so much more to live for than the latest fashions and coming-out balls, she begins to understand her mother better than ever, and she slowly starts to see past class distinctions. Though Faithful is lightly romantic, this book is more about Maggie's journey from indulged society girl to a thoughtful young woman who learns that money and comfort can't buy inner beauty, love, or true happiness and finds her way to becoming independent and strong. Fox's first novel is fascinating and mysterious; Maggie is a willful, courageous, and sensitive character, and the depictions of Yellowstone and its wild beauty will make you want to visit straight away. Cover Comments: This cover is what originally drew me to this book. The power of Old Faithful in the background, and the striking green dress are just beautiful, and the landscape is so striking. I love this cover, it is gorgeous! I want to read this ... Saw the cover a month or so ago and fell in love, but haven't gotten my hands on it yet ... Will though, very soon! I like the way it's been described. And yes, green book covers are always attractive to me. I loved this one despite my aversion of historical fiction.